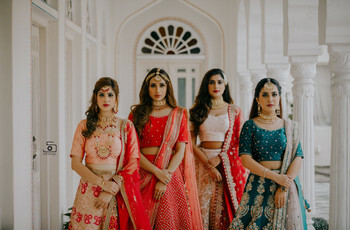 The Only Lehenga Wearing Style Guide for All Body Types You Need to See | Wedding Tips ARE YOU A VENDOR? We all want the Lehenga of our dreams but overlook the details which will suit us best. 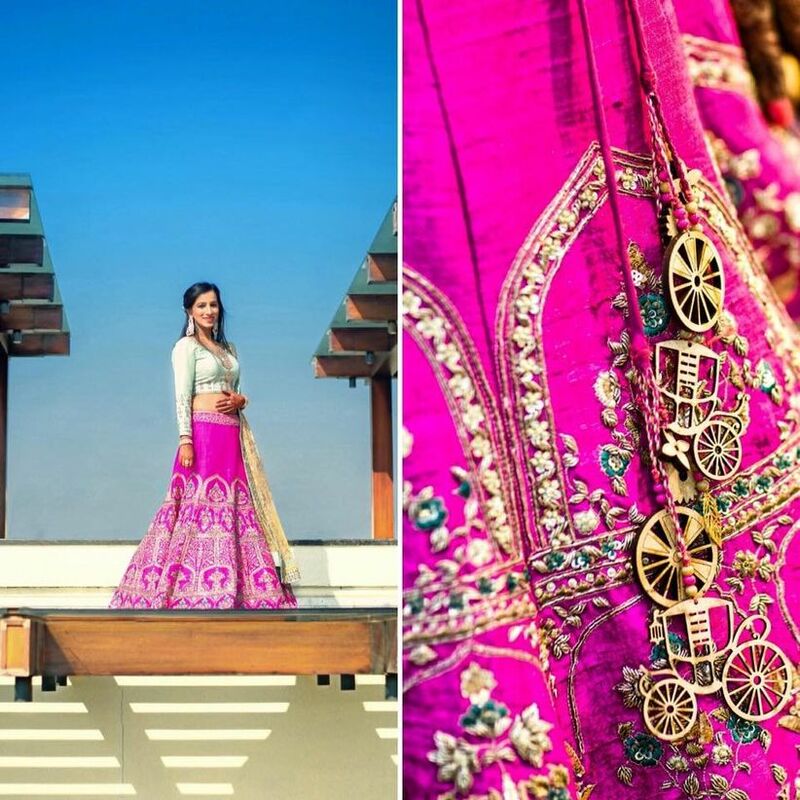 Here is a guide that will help you select the best Bridal Lehenga according to your body type. 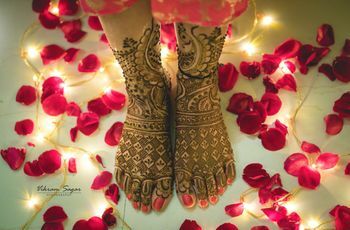 Every bride wants to look her beautiful best on her wedding day. 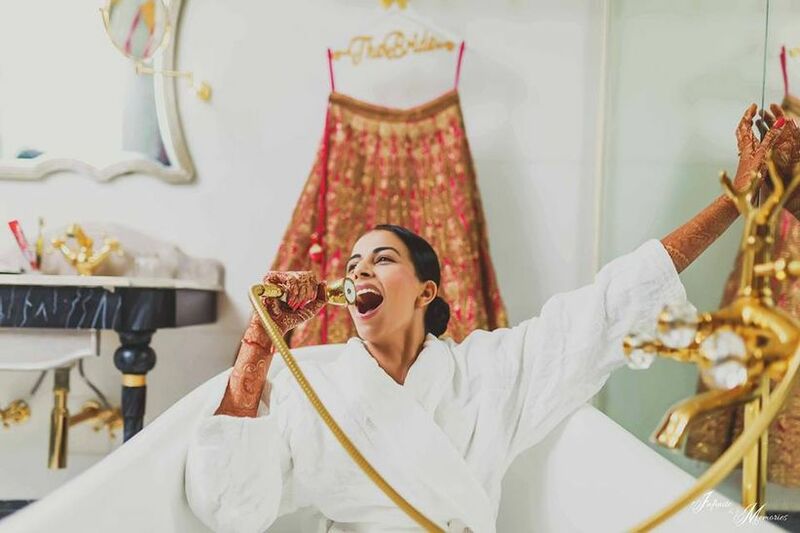 And that’s why a lot of thought goes into buying that perfect Bridal Lehenga. For any woman, purchasing her bridal lehenga is one of the most important decisions she makes in her lifetime. 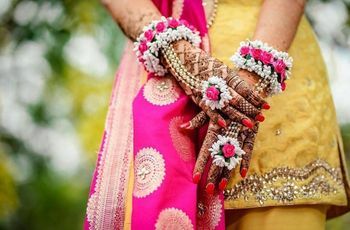 Every bride wants her lehenga to be absolutely beautiful and perfect, but what might look good on the paper may not look that great on you. But Lehenga wearing styles differ for different body types. Something that looked good on your friend at a wedding might not look that good on you. The idea is to find the perfect match according to your body type. 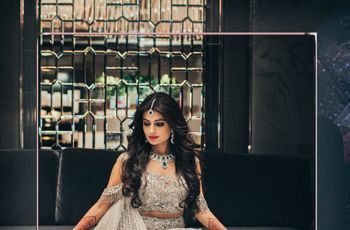 So, read on to see the various bridal lehenga styles that will accentuate your figure in all the right places. The ratio of your shoulders to your waist and hips define your body type. You could have a rectangular shaped, apple-shaped, pear-shaped or hourglass shaped body type. The following are the quintessential body has that we know of today. read on to find which one is yours. 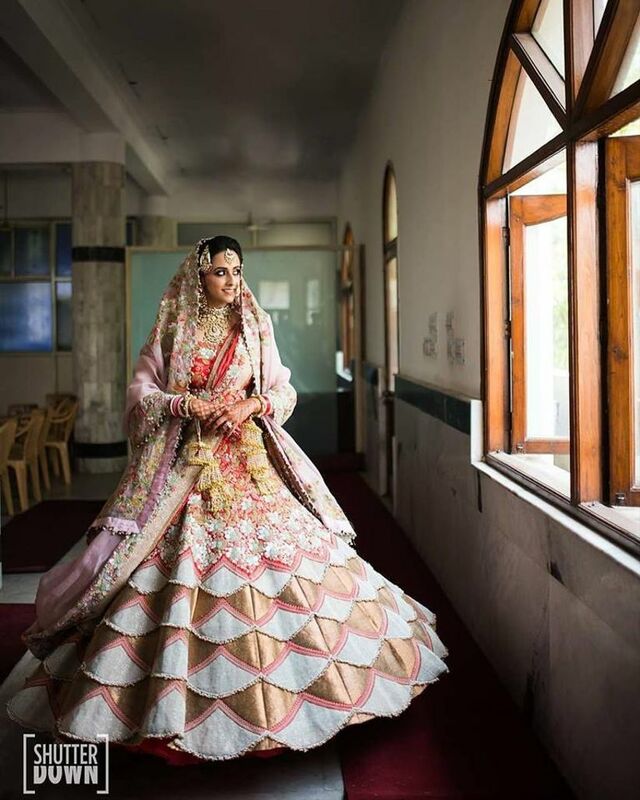 We have explored this at length in how to wear a Bridal Lehenga to look slim. 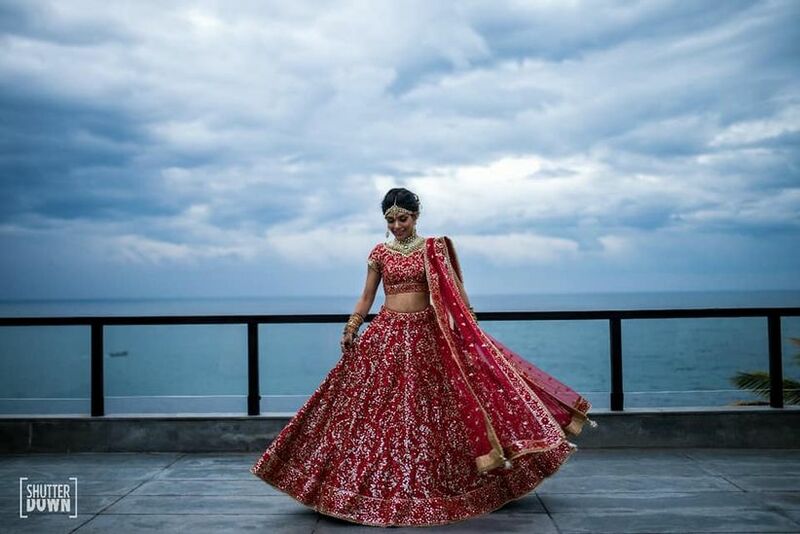 Since you have a rectangular body type, you need to create curves with your Bridal Lehenga. Who wouldn't want some accentuating curves right? We've got you! How do you do that? Opt for a flared Lehenga by adding a lot of net and can-can that can add to the volume of your skirt. Balance the flare of the Lehenga with a Dupatta that is stiff and can define your whole look. You can also drape it in a way to show off as much of your waist as you're comfortable with. What's more, you could either show off your arms by choosing a sleeveless blouse or extending them to be longer. If you have an apple-shaped body type that means your shoulders and bust overpower your waist and hips. So, the right Lehenga style for you would be a skirt that accentuated your lower body, to balance your shoulders and bust. Choose to don a Lehenga that’s flowy so don’t pick fabrics that snug to your body. For the blouse design, you can try the latest trend of cape blouse which will give an elegant appearance. You could also drape your Dupatta to drape it over your shoulders. This ruffled Lehenga is an ideal choice for you to consider. It features a stunning silhouette which has a little out-of-the-box design. A pear-shaped body would mean a heavier set of hips, thighs and legs than your upper half. So, how do you choose the right Lehenga style for yourself? 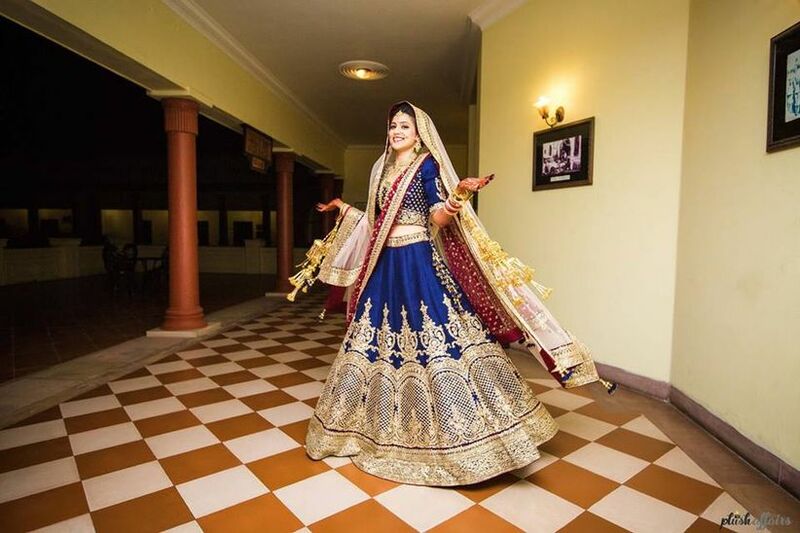 Try opting for a high-waist Lehenga and this will help you perfectly. This Lehenga wearing style will give you a beautiful look while you can balance the blouse and the Dupatta for an even ensemble. Go for a Dupatta draping style that covers the Lehenga from the front. There are endless options to choose a long skirt from. You can traverse from minimalistic designs to a heavily embroidered skirt which gives the impression of a heavily embroidered lehenga skirt. Any woman who has hourglass body type will agree that it is a blessing and curse, both. But in the case of Bridal Lehengas, it is definitely a boon. You can go for any Dupatta draping and Lehenga wearing style and it will accentuate your beauty. 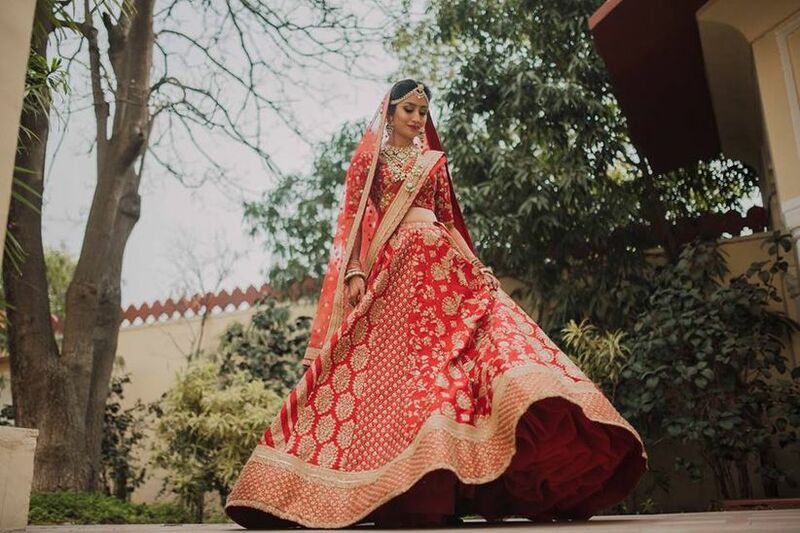 The markets are flooded with bridal lehenga designs. From minimalistic to a simple version or a heavily embroidered one, you can pick any one of these types. Keep in mind some of the pro bridal shopping tips before heading to look for one, though. Also, consider which colours flatter your skin tone and which don’t. The best shopping companions will help you through the experience and make it feel like a breeze. Make sure you go shopping with a few extra sets of eyes. Perhaps, your family or friends you always lived your shopaholic moments with. Take their help in the understanding of what looks good and what looks great! Complement your Bridal Lehenga with gorgeous makeup. Check out some of the best makeup artists in your region. 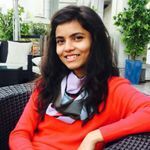 2 comments in "The Only Lehenga Wearing Style Guide for All Body Types You Need to See"